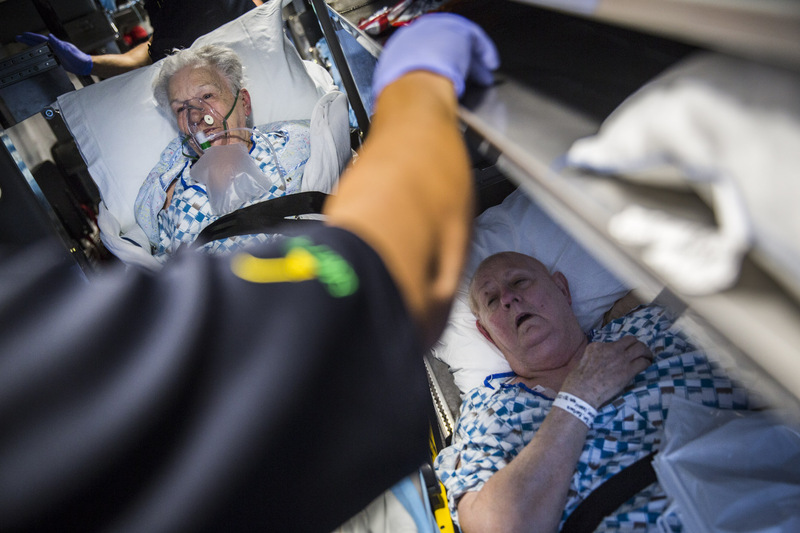 Firefighters and EMTs help evacuate Elaine Smith, left, who is suffering from pneumonia, and Barbara Ross, a stroke victim, from Beaumont Baptist Hospital on an ambulance-bus headed to Houston, in Beaumont, TX on September 1, 2017. The ambulance-bus crew, all firefighters and EMTs, from Weslaco, TX, arrived in Houston, TX in the wake of Hurricane Harvey to help rescue people in need. All of Beaumont Baptist Hospital was evacuated after water stopped working due to flood issues; patients were brought to various locations in Texas and Louisiana.